SN 602 as recieved after conversion to MoW service. 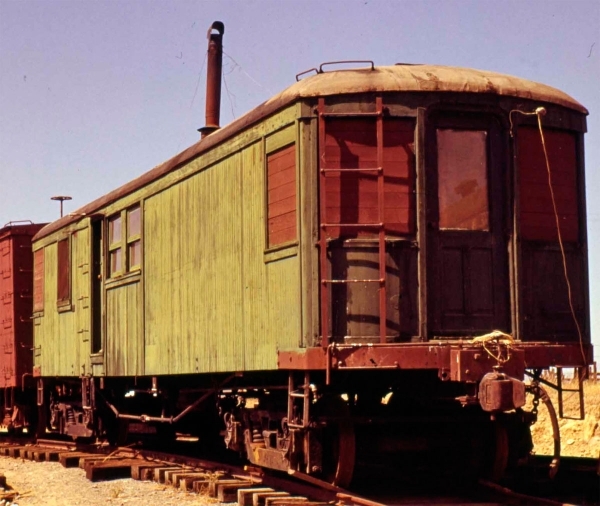 Car 602 is an arch-roof, double-end, double-truck, wooden, box motor. 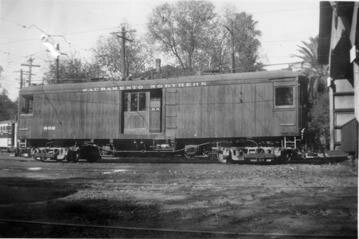 602 was built by the Holman Car Company of San Francisco for the Oakland, Antioch and Eastern Railroad in 1911. The car was built with a clerestory roof. The roof was rebuilt to an arch in order to better harmonize with the other OA&E equipment in 1914. It went through all the South End ownership changes always retaining its 602 number until it was retired from revenue service in 1948 and became SNMW 83. 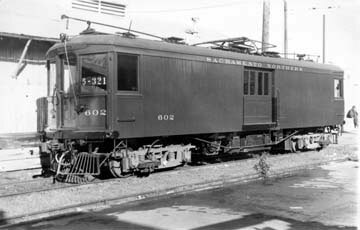 Car 602 appeared to be little used over its lifetime on the Sacramento Northern. 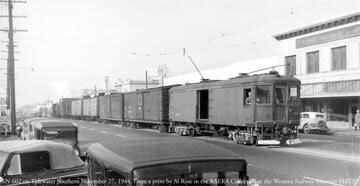 Vintage Caption: SN 602 in Sacramento on October 10, 1939. Owners: Sacramento Northern 602. Oakland, Antioch & Eastern 602. Technical Data: Wooden box motor. Built by Holman Car Company in 1911. Total car weight, 78,000 pounds. Trucks: Baldwin 79-30 B. Wheels, 36-inch diameter steel. Axle. Journals. Traction motors, (4-110 horsepower @ 750 VDC, or 90 horsepower @ 600 VDC, inside hung). Air Brake Equipment: Westinghouse Traction Brake, AMM. Automatic brake valve, (G-6). Independent valve, (S3A). Triple valve, (Plain). Double check valve, (#15). Brake cylinder, (12 X 12). Governor, (type N). Air compressor, two General Electric (CP-29). Dimensions: Width, 9’ 4”. Length, 45’ 0”. Height, 14’ 4”. Truck centers, 29’ 5”. Truck wheelbase, 6’ 7”. Propulsion Equipment: Westinghouse Electric and Manufacturing type HL. Master controller, (C-28). Switch group, (265D). Reverser, (284E2). Traction motors, WE&MCo. (321). Gearing, (bull 61 tooth, pinion 16 tooth, ratio 3.81 to 1, ? face). Control switch. Power resistors, (8” 3 point). MU plugs, (12 point). Dynamotor, (DM-13). Misc Data: Couplers, AAR knuckle couplers. Pantograph, (Brown diamond roller pantograph). Trolley wheel. Trolley base. Whistle. Current Condition: This is a stripped car with no electrical or brake equipment. Some doors and window locations were changed for M of W service. Proposed Future Treatment: This car will be restored to operational condition. Electrical and mechanical equipment are on hand. Photo 1 Caption: SN 602 outside the Chico car house in November 1946.